Asking for what you want seems obvious, but many don't. Until the past year, I didn't. I worried that revealing what I wanted would make the price go up -- and sometimes it probably does. But, I decided that paying a bit more for something I really want beats going home with nothing. First, give the sale or store a quick walk through. Then, if you don't find what you're looking for, just ask -- ideally out of earshot of other shoppers. Since I started asking, I've been successful 10 to 15 percent of the time. That's not bad for a two-second question. Since I've started asking about vintage perfume, I've had yard sale sellers run inside to get some (multiple times), point me to a reject box under the table, and walk me out to the curb to drag bottles of the trash. None of the sellers thought old perfume would sell, so they didn't bother with it. I know a flea market dealer who always asks about furniture at yard sales. Numerous times, I've seen sellers lead her inside to see furniture they hadn't intended to sell. I've had similar experiences asking about old Christmas ornaments and vintage Pyrex. I've also had success asking for things at thrift stores. One employee pointed me to some shelves hanging I'd never have thought to look. Others have grabbed things out of the back room or told me when (specific days and times) to come back. Craigslist and lots of newspapers offer online garage sale classifieds that include photos of the merchandise. Sellers who advertise yard sales on Facebook often post photos of their goods as well. When I'm looking for sales and prioritizing them for my yard sale route, I click to enlarged versions of those photos and scour them for the things I want. If I find something promising, those sales become the first stops on my routes. I also check the Facebook pages belonging to my favorite antique malls and indoor flea markets pretty often. When they post merchandise photos (which some do daily), I scrutinize them for things on my wish list. At donation-based thrift stores, the profits typically go to support a specific charity or organization. If you're looking for something specific that never seems to wind up the shelves, yet you suspect it gets donated, it could be that they don't see it as salable. Or, they know it is because someone else always buys it fast. In either case, you can increase your chances of getting those items. If the thrift store has volunteer workers (more likely at local charity shops than national chains), get friendly with them. If the employees are paid, get in touch one of the organizers instead. This strategy works best when your contact has a interest in the charity's success. Once you've made your contact(s), tell them what you're looking for and offer to make a donation (in addition to the purchase price) for every item they help you find. Ask them to call you if they get your target items in the store, or even to set them aside for you. Your donation amount needs to be worthwhile to the charity, but not cost prohibitive to you. If you're looking for a large item, such as a piece of furniture, offer a specific amount per piece. For small items, offer a percentage of every purchase price as your donation. It's not fair to ask paid employees to take on extra duties just to help you get what you want. Some may offer because they're nice, but they may forget when things get busy. 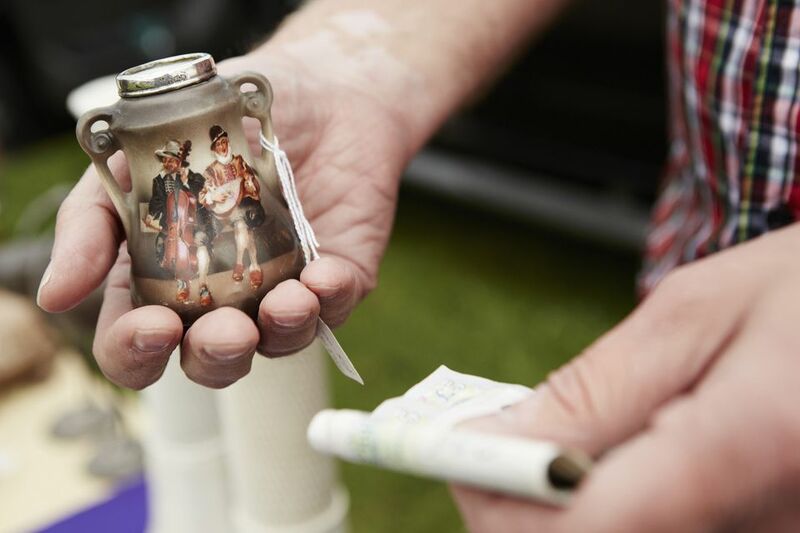 At thrift stores with paid workers, antique malls, and indoor flea markets with permanent booths, offer a finder's fee per item to employees when they hold or notify you about items you want. Calculate the finder's fee as you would the donation to a charity above. Then, communicate whether you'll pay the fee on all items found for you or just those you choose to buy. If you opt for the latter, make sure you buy often enough for the employee to bother.